EUS meets Voxel-Man is a multimedia training system which provides a unique approach to endoscopic longitudinal ultrasound in gastroenterology. 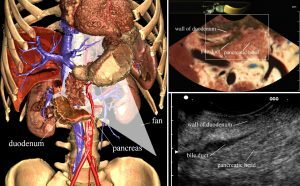 Due to the flexible tip of the endoscope, this imaging modality produces oblique cross-sectional images, which require an excellent orientation in the human anatomy. Navigation of the virtual probe is controlled with a mouse, simulating the rotation and sideways angulation of the endoscope. The scenes displayed on the monitor were created from a high resolution model of the inner organs derived from the Visible Human. 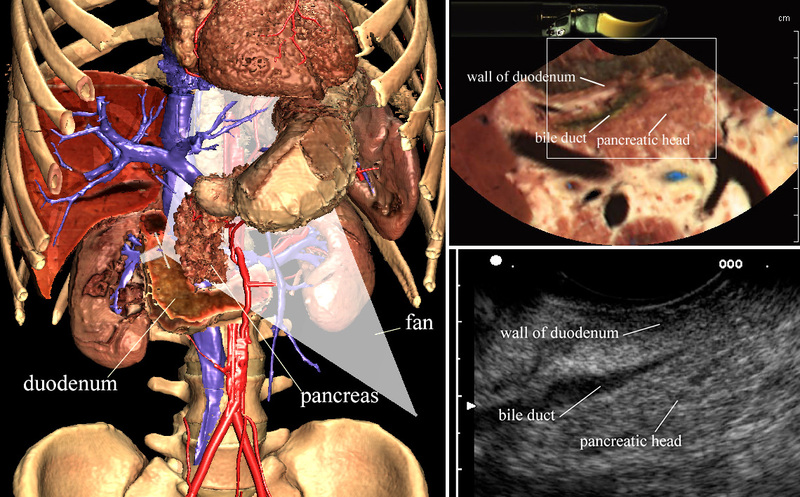 They consist of a three-dimensional view of the anatomy on the left, indicating the current position and orientation of the ultrasound probe relative to important structures such as vessels and organs, and the resulting anatomical cross-sections shown on the right. For comparison with clinical EUS examinations, they are complemented with a typical sector image of a linear EUS instrument. Although this approach provides only two degrees of freedom for controlling the probe instead of six available in a real examination, it has been found that all of the important landmark structures can be found. By providing a better insight, the program makes an important contribution to patient safety.